A few months back I picked up a Makita 2030N combination planer/jointer and I’m finally getting around to refurbishing it. The machine is in good condition overall but being 30 plus years old has some issues that I need to correct. The first thing I found was that the knives were as dull as marbles and the previous owner had them set way too low. After removing, cleaning and sharpening the knives I re-installed them at the proper height. There is a thin hold down that has two springs that keep the knives snug enough to set them without tightening the gibs too much, very helpful device. I also like the way the knives are made with a mild steel back and the tool steel cutting edge inset to it. The soft back makes honing easier. The second issue is not so easily resolved. 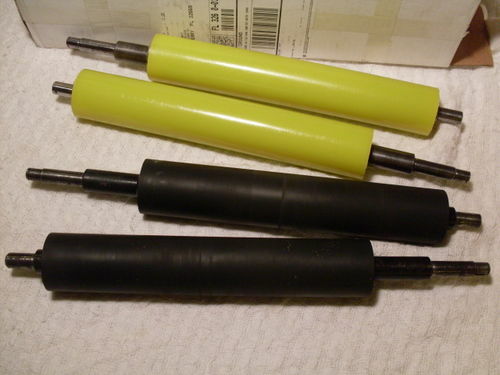 The urethane feed rollers are glazed and as head as plastic, no grip whatsoever. To compound the problem they are also so worn that by the time you get them to make good contact with the workpiece the chipbreaker is pinning it to the bed like Hulk Hogan. As you can imagine it will not feed more than a few inches before the board stops. Now I must say if I push the board through the sharpened knives this planer produces the finest surface I have seen straight from the knives of any planer. Very Nice. I’m really needing to get those feed rollers recovered and that’s where the problem comes in. I can’t figure out how to remove the drive sprocket from the feed roller assembly. It has a retaining ring, I took that off but the sprocket will not budge. Having learned the foolishness of getting all gorilla with things I don’t really understand and trashing them in the process I am turning you my fellow Lumberjocks. Any information on this procedure (which Makita left completely out of the manual) would be greatly appreciated. Based on the parts diagram, it looks basically the same as my 2030.. After you take off the retaining clip, the gear should pull straight off along with the woodruff key. If it won’t come off with a gentle pry from behind with a large flat blade screwdriver, you might need to get a puller. As for recovering the rollers.. I highly recommend Western Roller. I have a 2040 that I disassembled a while back. From what I remember once you remove the e-clip you should be able to pull the sprocket off. Is it a keyed shaft? If it is, it should pull straight off. You may need to use a gear puller. Brad: That’s what I thought but I wanted to make sure before i start prying on this thing. 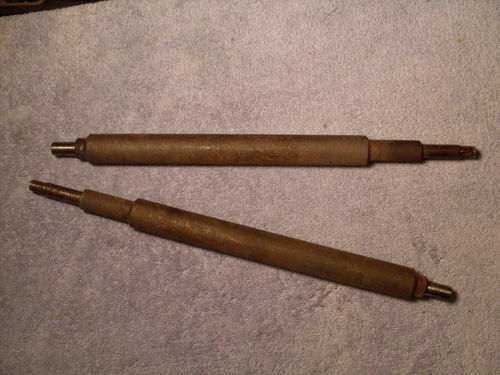 I stopped at a local pawn shop and picked up a nice pair of gear pullers (large and a small) for next to nothing and will get after it tomorrow. Thanks for the reply. Sarit: It does have a small key and as you and Brad recommended I have picked up a gear puller for the job. I have the recovered ones in my working machine currently, and they have performed flawlessly so far. if you are still fighting it you may need a little heat. I mean a little, like a heat gun or halogen light. It will let the plastic expand enough it will slid right off. When I am putting on snug bearings I freeze the shaft (over night)and gently warm up the race of the bearing. Usually with a light. when every thing is ready they just slide right in. Brad. I’m assuming the yellow ones are urethane rubber and are soft. Like I said the white ones on my feed rollers are hard and slick. I’ll look for a local outfit that knows the proper diameter and if I can’t find one Western Rollers here I came. Thanks again. Shawn Masterson. I was wondering if freezing would be beneficial. Looks like it will. I’ll try your trick on the arbor bearings for an ancient Grizzly G1023 I’m also restoring as well as the feed roller sprockets on the planer. Now if I can just find the right start capacitor for the 3 HP motor on that table saw I’ll be on my way. I can’t thank you all enough for the input, I love working on old cast iron but researching it can be difficult. Fortunately what the manufacturers neglect to tell the experience of others can supply. Thanks and God bless. just go to eBay for the capacitor. those are universal just match the MF rating and the shape. I would make sure it is ok to freeze the new roller material. 2030N is an awesome little machine. I”ll post some photos of it when my son shows me how. To Shawn Masterson, I bought a couple of bearing pullers at a pawn shop and it was a breeze to replace the bearings and the capacitor wasn’t the problem. Upon closer examination I saw that the previous owner of the G1023 had used 14/2 cord for an extension, 50’ of it!! No wonder the saw wouldn’t run. I replaced it with 8’ of 10/3. I just got finished putting a new set of feed rollers in the 2030N I inherited from my father. The dark red plastic on the old ones had started coming off in large chunks. I didn’t know you could have them recovered so it looks like I will have a back-up set. By the way, the new set for mine came from eReplacementparts.com and though they were nearly two bills each they were a perfect fit. The replacement took about two hours and the only hitch was that I needed to get my son to help hold up one end of the new rollers while I got the brackets screwed in on the other end. Yep, I also wound up replacing all those darn Phillips head screws with cap screws. I did manage to get them out without an impact wrench but just barely. Just bought a 2030 with both feed rollers completely disintegrated & nothing left but the shafts. I would like someone to measure the dia. of their new rollers for me. This is the 2nd one of these I have bought with the same problem. I rebuilt the 1st set of rollers using the cheapest hockey pucks I could buy. Pucks were centernbored to snugly fit the shaft, glued to the shaft & stacked to each other with PL Premium construction adhesive. Froze them in the deep freeze then had a buddy turn them down in his metal lathe to the correct OD (which I wrote down & have since lost). They worked awesome. So if someone could measure their rollers for me I will attempt the same repair again. Thanks. I have a makita 2030 I purchased well used a little while ago. it works great but it is missing the entire assembly for adjusting the height of the planer except the main threaded shaft. I can buy most replacement parts but I cant get the shaft support part number 311410-9, and the handle shaft part number 325535-3. Does anybody know where I can get these? Maybe someone has one of these machines for parts? I too bought an old 2030N but with no instruction manual. The knives on the planet need to be sharpened, but I have no idea how to reset the proper height. There’s a lot of room for adjustment, so there must be a proper way. Any suggestions?